Jessie Laurita-Spanglet with Meredith Bove. Jessie Laurita-Spanglet joined the faculty of the Wake Forest Department of Theatre and Dance in the fall of 2015 as a Post-Graduate Teaching Fellow. 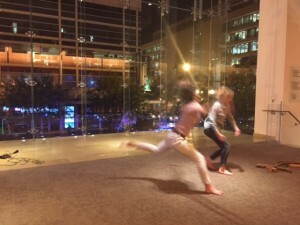 After graduating with an MFA in dance from the University of Maryland, College Park in the spring of 2014, Jessie spent the following fall as an Artist In Residence at the University of Maryland, Baltimore County. In recent years Jessie has had the great pleasure of dancing and collaborating with Meredith Bove, Matthew Cumbie, Dance Exchange, Maree ReMalia/Merrygogo, Mansurdance, Sara Beth Oppenheim/Heart Stück Bernie, and PEARSONWIDRIG DANCETHEATER among others. Jessie’s strong interest in collaboration has led her to work closely with dance and theatre artists, musicians, composers, and writers. Jessie is a Stott Pilates teacher with a certificate from the Balance Pilates Training Center in Richmond VA, and holds a BFA in Contemporary Dance from the University of North Carolina School of the Arts.